We carry a variety of products designed to mark roads, parking lots, factory floors, steps and ramps. Our products are simple to install with no contractor required. Our aluminum based 2" Wide and 4" Wide Floor and Pavement Marking Tape is a self adhesive, conformable, reflective product that can be used on highways, factory floors, parking lots, and other surfaces. Since it is alumimum based it molds itself to the surface if enough pressure is used during installation. This product holds up well in all weather and can handle light to medium traffic. It is easy to install and easy to replace if damaged. A standard and heavy duty grade is available. 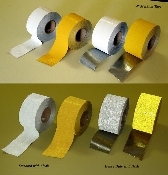 These rolls can be applied using our Floor Tape Application Machine. 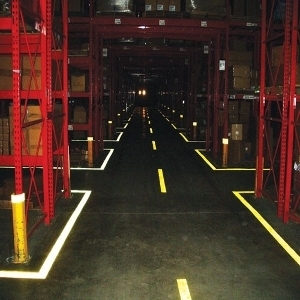 Our Armadillo Floor Tape is very tough non skid reflective floor tape designed to mark factory floors. It is self adhesive, easy to install, and will hold up to heavy factory traffic. It comes in 3" x 108' rolls. Blue, Red, White, Yellow and Green. Our tennis, pickleball and basketball 2" Court Tape is based on the same product as our aluminum based pavement in 2" rolls. This product provides an easy and quick way to stripe any type of court. This product is popular for pickleball courts because it can be removed with minimal residue. 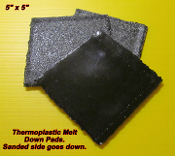 We have a full line of PreMark Preformed Thermoplastic at www.preformedthermoplastic.com . This is an extremely rugged product and can handle heavy traffic. It installs with a basic road or weed burning torch and has an extremely long life. It comes in white, yellow, blue and red and in several widths. Preformed thermoplastic can be applied to both asphalt and cement surfaces. Our Raised Reflective Road Markers are manufactured by Stimsonite. They are very reflective, rugged and easy to install. We carry Yellow, White, Red, Blue, Green, Yellow/Red, and White/Red. The markers are available with or without an adhesive butyl installation pad or more permanent melt down thermoplastic pad. 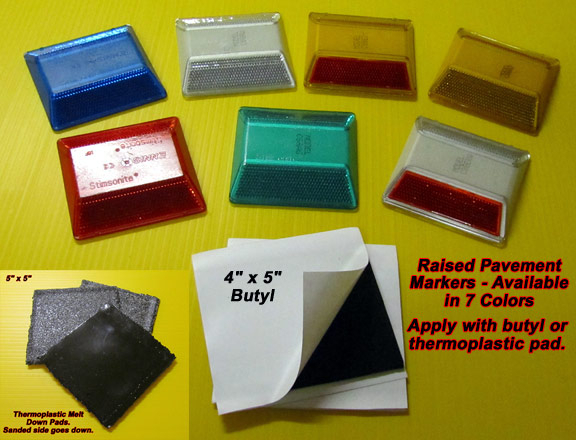 We also have the butyl and thermoplastic Marker Adhesives available by themselves for those who already have markers but need a way to install them. Our Black Non Skid Tapes in 1" thru 36" widths. Our non skid tapes are very easy to install and can handle heavy foot traffic. Our 4" x 150' STANDARD grade pavement marking tape rolls are designed to stripe asphalt & fully cured concrete surfaces, parking garages, warehouse floors, factory floors, roads and any other area where high visibilty delineation is needed. 2" Foil backed floor and pavement marking tape in 150 foot rolls. Available in yellow and white. Self adhesive. Semi permanent or temporary applications. Standard and heavy duty grades. 2" Foil backed tennis or basketball court marking tape in 150 foot rolls. Available in yellow and white. Self adhesive. Semi permanent or temporary applications. Can be removed. Reflective Two Way Stimsonite Road Markers. 4" x 4". Currently available in blue, yellow, white, yellow/red, green, red and white/red. Can be purchased WITH or WITHOUT adhesive pad. 4 x 5 double sided self adhesive butyl pad only. For adhering reflective road markers to pavement or cement. Easy to use. Designed for construction areas or light to medium traffic areas. We accept Master Card, VISA, American Express, Discover, Paypal Payments & Money Orders as payment. We invite you to browse through our store and shop with confidence. You may create an account with us if you like, or shop as a guest. Either way, your shopping cart will be active until you leave the store. If you have any questions please feel free to contact us at steve@reflectivestore.com or call (850) 934-3157 for assistance. If you need to request a quote you can email us or our FAX the request to (888) 789-5422.